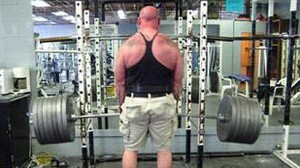 If you wish to pursue the sport of strongman, you better be deadlifting and squatting. Your core strength is crucial. You may have great power in your chest, biceps, calves or maybe you have balls of steel, but if you can’t grip it, you can’t lift it! Work your grip and increase the strength in your forearms. Core strength and grip strength together represent a powerful combination that can be applied to a variety of strongman disciplines. Personally I do heavy hammer curls. First I pre-exhaust my biceps with alternating dumbbell curls until I can no longer curl with proper technique. Then I transition into hammer curls keeping the dumbbell tight to the body, curling to my mid chest. I start at 80 pounds and finish to my max at 190. Low reps say six reps to your max with sets of two to three. Following this, apply classic wrist curls, standard and reverse. Light weights and reps of 10-12, total – three sets. Another important exercise is wrist rotation with dumbbell in hand (hammer position). Slide the weight to the top, away from the hand. Supporting your forearm on a bench, give the dumbbell enough space to rotate from side to side. You can even do this from front to back. The primary goal of this exercise is to stretch and rotate to the max. So go light and maintain good control. GET A GRIP and go far! !